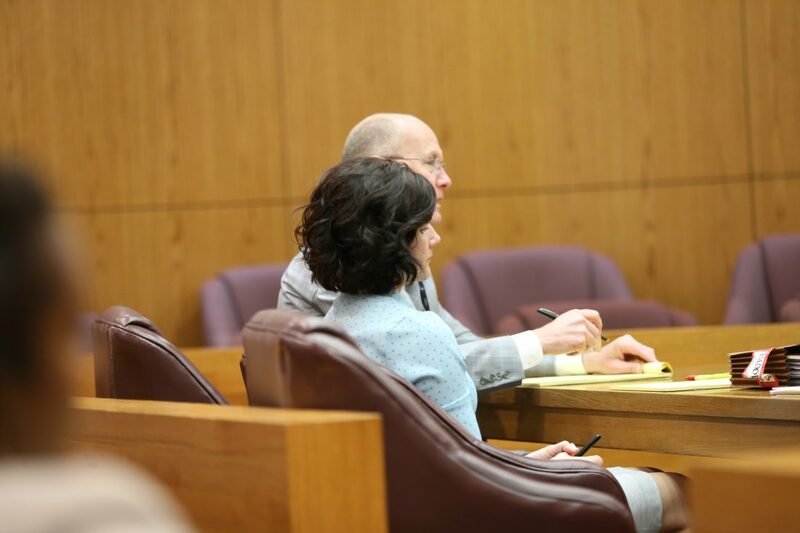 Brindley D. Blood appears in Douglas County District Court during her preliminary hearing on Wednesday, March 20, 2019. She is seated with attorney Tom Bath. Both sides agreed in court Wednesday that evidence showed a Lawrence police officer was negligent when she accidentally shot a man using her gun instead of her Taser as intended. But did the officer’s mistake rise to the level of recklessness, which Douglas County District Attorney Charles Branson has to show in order for a felony charge of aggravated battery against the officer to stick? Douglas County District Court Judge Peggy Kittel is mulling that over and plans to announce her ruling next week. 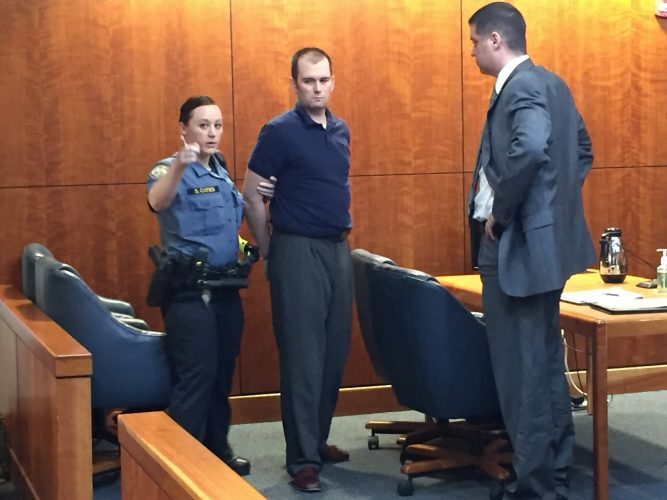 At a preliminary hearing Wednesday for Brindley D. Blood, 36, Kittel heard testimony from the man who was shot, Lawrence resident Akira S. Lewis, as well as several law enforcement agents. Kittel also saw police dashcam video of the traffic stop that escalated into a fight and then the shooting. 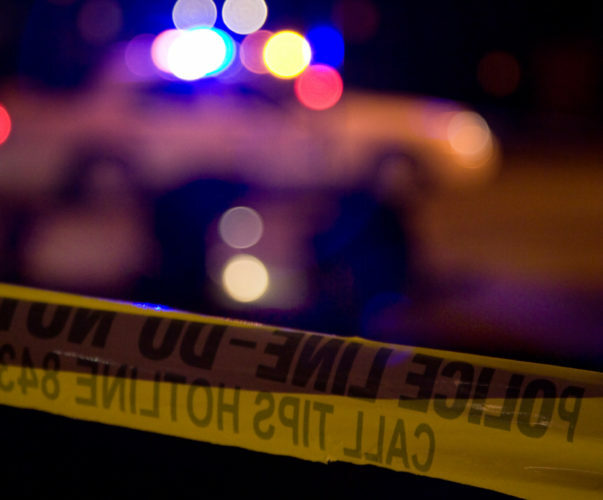 The shooting occurred about 5:15 p.m. on May 29, 2018, in the 100 block of West Sixth Street, after another officer pulled Lewis over for not wearing his seat belt and called Blood for backup to arrest him when Lewis refused to provide his information. Lewis argued with the first officer, cursed at him, then jumped out of his SUV, punched the officer, lifted the officer up off his feet, flung him to the pavement in front of a car in the lane of traffic, before landing on top of him in the street and continuing to grapple, video played in court Wednesday showed. In a matter of moments — less than two seconds, her attorneys estimated — Blood ran from the other side of the SUV, drew a weapon, stood over the two men on the ground and fired. Branson said Wednesday’s legal question wasn’t whether Blood had the right to defend her fellow officer. “There is nothing at all in this situation that justifies the actions of Mr. Lewis; Mr. Lewis is squarely, firmly in the wrong for his actions,” Branson said. However, in arguing for the judge to bind Blood over for trial on the felony charge, Branson said her actions met the legal definition of aggravated battery for recklessly hurting another person with a deadly weapon. He said that despite “extensive training” on the use of Tasers and firearms, the officer showed a “gross deviation” from the appropriate standard of care in such a situation. “Ms. Blood was reckless in not determining which instrument she was using at the time she shot Mr. Lewis,” Branson said. Blood’s attorneys, Tom Bath and Michael Riling, argued their client may have made a mistake but that — particularly given the seconds she had to take action — she wasn’t reckless. “It’s instantaneous. The officer has to make a decision,” Riling said. Blood was a rookie officer. She’d been on the street just two months before the shooting, a Johnson County Sheriff’s Office detective who interviewed her testified. Prior to starting her patrol work, Blood completed the Lawrence Police Department’s usual 24-week academy followed by 16 weeks of patrol training with a more senior officer. She’d been re-certified on both her Taser and firearm use since the academy, police department trainers confirmed. Blood has recently resigned from the Lawrence police force, as of Jan. 28, a department spokeswoman, Sgt. Amy Rhoads, said this week. 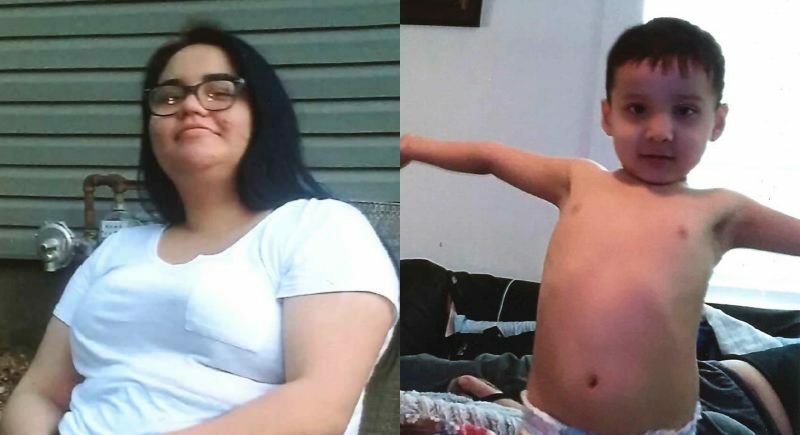 Previously, Blood had been on paid administrative leave. Lewis is charged with multiple misdemeanor crimes from the incident, including battery on a law enforcement officer and failure to wear a seat belt. His case remains pending, also in Douglas County District Court. The dashcam video showed the escalation of the stop that preceded Blood shooting Lewis. When Officer Ian McCann walks up to the driver’s side window of Lewis’ SUV, he politely introduces himself, says he’s assigned to a seat belt enforcement effort and that he pulled Lewis over because he saw he wasn’t wearing his seat belt. Lewis begins to protest about being stopped for not wearing a seat belt, then proceeds to drive forward about a car length, causing McCann to jump backward away from the SUV. Lewis then stops, McCann walks back to the window and their conversation continues — with Lewis yelling expletives and the officer remaining polite. Lewis refuses to provide his name or driver’s license and repeatedly demands that McCann summon a supervisor to the scene. He tells McCann there were two people in front of him not wearing seat belts that should have been pulled over instead of him. McCann says he did not see those people. McCann explains to Lewis that if he fails to comply, he will be placed under arrest and taken to jail. He tells him he won’t call a supervisor, as the stop is blocking traffic at a busy time of day, and tells him he can file a complaint later. He repeatedly tells Lewis that if he complies, the seat belt ticket situation will take about four minutes and he can be on his way. 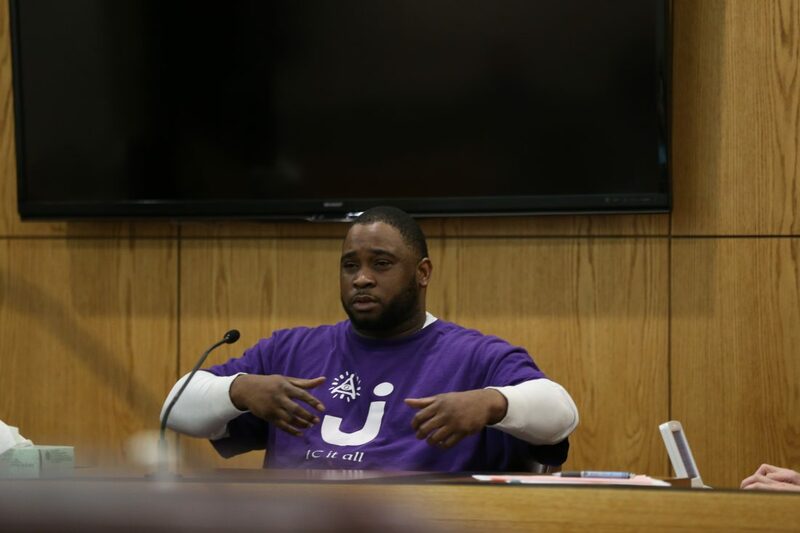 Akira S. Lewis, of Lawrence, testifies Wednesday, March 20, 2019, in Douglas County District Court during a preliminary hearing for a Lawrence police officer charged with aggravated battery for shooting Lewis as he attacked another officer who was trying to arrest him. When he took the witness stand Wednesday, Lewis admitted he wasn’t wearing a seat belt but said he thought McCann pulled him over because he was black — because he didn’t pull over two other people Lewis claimed weren’t wearing seat belts ahead of him. Both McCann and Blood are white. “He was out looking for seatbelts and he passed two people before he looked up and seen me; that’s why I wanted to talk to a supervisor,” Lewis said. Blood’s lawyers confronted Lewis about why he escalated the situation by refusing to provide his name and driver’s license — pointing out the fact that Lewis had outstanding arrest warrants that the officer wouldn’t have known about without that information. Lewis said no, and said that he did not know he had warrants because his address had changed. Lewis admitted to getting out of his car, picking up McCann and ending up on the ground. Lewis said he was not trying to get McCann’s gun, denied continuing to attack the officer on the ground, and said he then tried to get up. He described his thoughts as officers handcuffed him and applied pressure to his wound until an ambulance arrived. “When you’ve been shot, you breathing in and out, praying, on the ground saying, ‘I don’t want to die,’ and stuff like that,” Lewis said. Senior Lawrence officers who trained Blood at the police academy testified about what she and other recruits learned and practiced there. The Tasers used by Lawrence police are yellow instead of black like their guns, they said. They’re also significantly lighter-weight than guns and holstered on the opposite side of the belt, while officers are instructed to put their guns next to their dominant hands. Lawrence police are issued gun holsters that require a two-step process to get the gun out, first flipping a hood over the gun forward then pressing a lever to unlock it from the holster, trainers said. The academy’s weeklong firearms training includes practicing draws and firing an estimated 1,500 live rounds. When Johnson County Sheriff’s Office investigators interviewed Blood at her attorney’s office, she described trying and failing to physically force Lewis out of his SUV then seeing him tackle McCann. “Her statement to me is that she knew she had to Tase this guy,” Johnson County Detective Leslie Smith testified. Blood said she drew what she thought was her Taser, stepped back to ensure she could aim without hitting her fellow officer, stated “Taser Taser Taser,” then fired. When she heard Lewis say, “Ow,” but did not see any wires she realized she’d fired her gun instead. Blood told Smith that she then said aloud, “Oh (expletive), I shot him,” before holstering the gun and starting first aid. Branson asked the detective whether Blood ever explained how her gun ended up in her hand instead of her Taser. Smith said that Blood had mentioned “muscle memory” but didn’t really have an explanation. 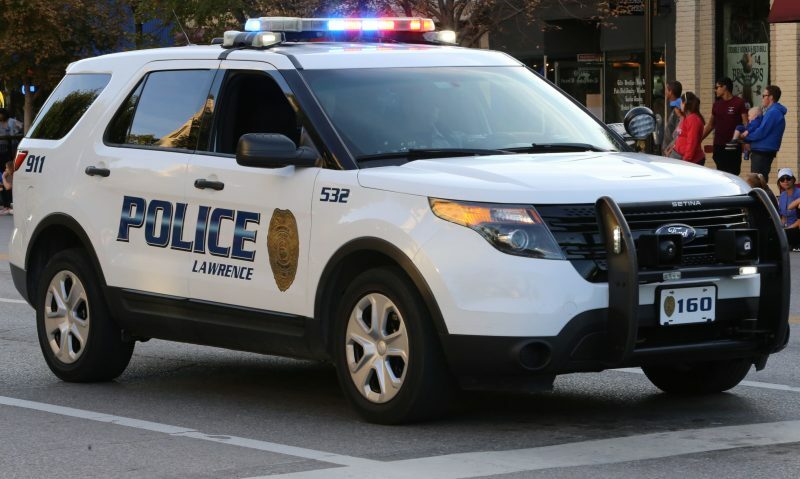 Last year, the Journal-World requested all dash-cam, traffic camera or other images of the incident, but the city of Lawrence denied the request, saying such recordings were considered criminal investigation records and that the investigation was ongoing. Following the incident, the Journal-World found that Lewis had two outstanding warrants for failing to appear in Douglas and Johnson county courts in traffic cases, in which he was charged with driving without a license and other violations. He has been ticketed six times in the past 10 years for driving without a valid license. The Johnson County Sheriff’s Office’s background check of Lewis confirmed the warrants, that his license was suspended at the time of the incident, and that he’d had six suspensions since 2010.